It’s been a number of years since Brim Brothers unveiled their power meter concept, and today they’ve launched pricing and availability details. 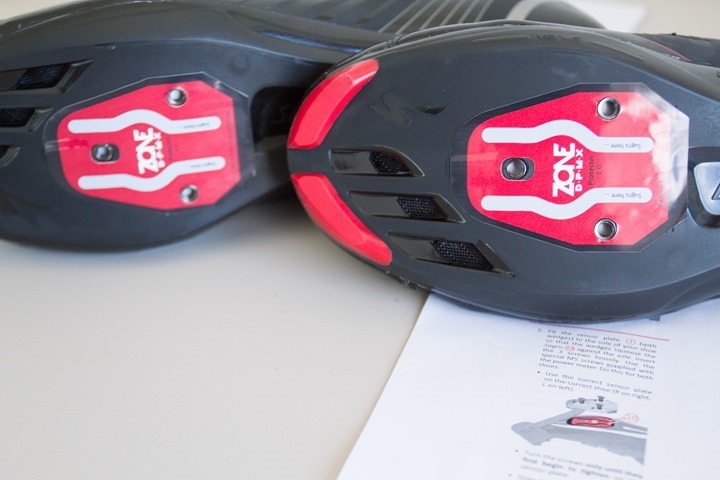 The Zone power meter is a cleat based power meter that is affixed to your cycling shoe, allowing you to move from bike to bike without the need to install a power meter on the bike. The system communicates to head units using ANT+, so it’ll work with the majority of head units on the market today. The Zone is Speedplay Zero-only, which means that you’ll need to either use that pedal type or switch to it. On the flip side, there are no restrictions on crank types or the like, as some power meters have today. I had the chance to head out this morning and go for a first test ride with a nearly final production unit. There are some minor changes from a production standpoint still coming, so that may alter the results. As usual, it’s just one ride. Which means it doesn’t really predict success (or failure), neither short nor long term. Rather, it’s just a data point. I’ll be taking the unit home with me to put it through a much longer testing cycle, as usual. The unit I received was fully boxed in near-final packaging. By ‘near-final’, I mean that there are some minor tweaks that they’ve stated they saw on the boxes such as typography tweaks or small changes in material thickness, as well as the manual being printed in a smaller format than the 8.5×11” sheets of paper I had. 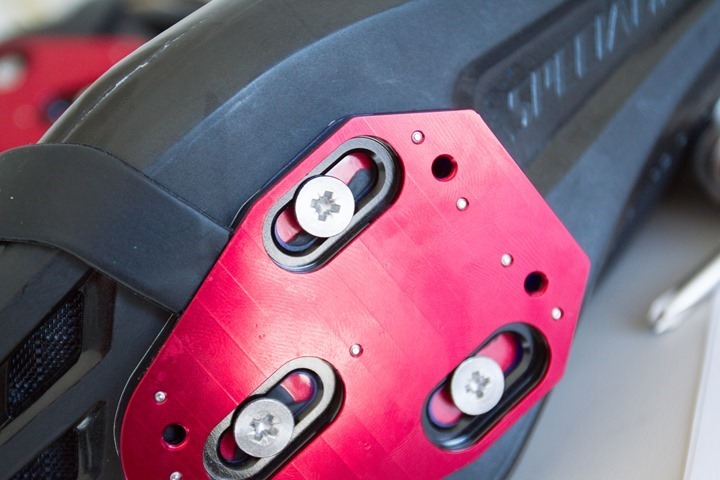 The unit uses a sensor plate that contains the ceramic force sensors (no strain gauges), which attaches to the bottom of your shoe. Then a small flat rubber cable runs up along the edge of the shoe to the pod on top, which houses the communications pieces and battery. The reason for having a cable connecting them is really to comply with Speedplay specifications on what can and can’t be hanging out near the cleat. So at present putting a battery and communications pieces in there would be challenging. I’ve gotta say, the plate itself is just a thing of beauty. Well at least until after the first use, then it looks all scratched up as you’d expect from ground/pedal contact. But, until that point it’s really pretty. 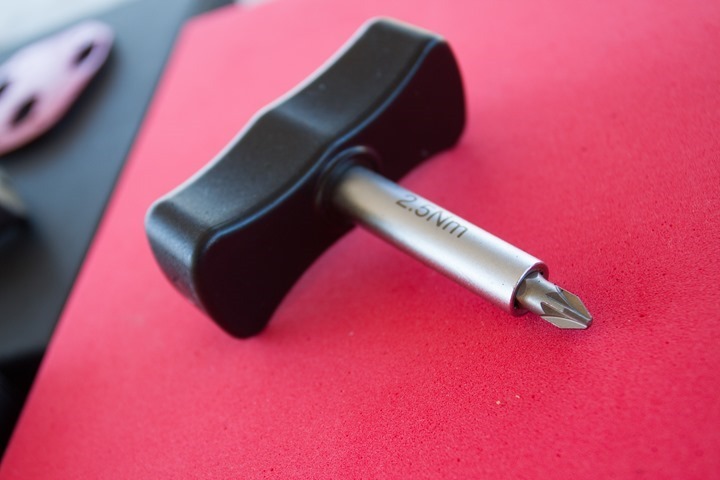 The box also includes a screwdriver torque wrench that will ensure you don’t over-tighten. Seems like a logical idea that Garmin should have added a year ago. Or, said differently, Brim clearly learned from Garmin here. I’ll dive into a more detailed unboxing as part of an In-Depth Review down the road, so for now lets get it installed. We’ll start installation with my shoes nearby, along with the Zone set. You’ll also need your Speedplay cleats too. To begin, go ahead and put the left pod next to your left shoe and the right one next to the right shoe. While it would become obvious later in installation that you’ve got them installed on the wrong shoes, it’s really better to avoid the waste of time. Then you’ll go ahead and take one of the stickers out. They gave you a bunch of stickers in case you want to move them to other shoes later on. The sticker acts as a simple template for where to place the glue. It also allows you to remove the system later on if you want to change/move it. It’s kinda brilliant. Next, you’ll make little worms out of them and apply them to the bottom of the shoes. For this entire process you have about 15 minutes, so it’s not rushed or tedious. 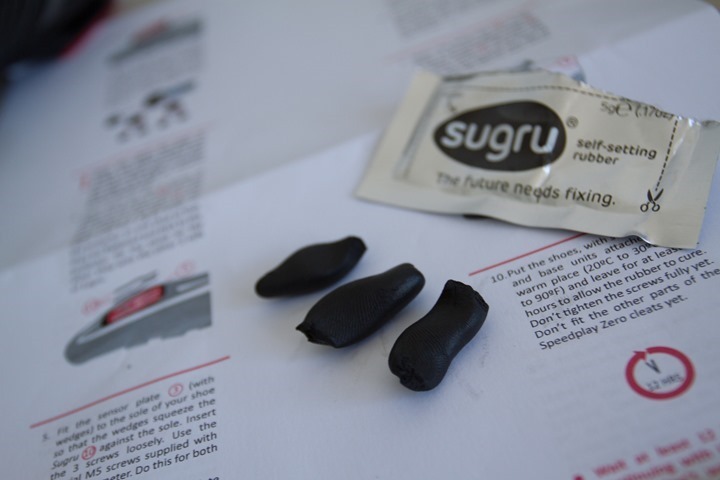 We’ll keep screwing in until the Sugru stuff squirts out near the screw holes. You won’t screw anything in hard here, it’s pretty light for now. Once this is done you’ll go off and do something that keeps you busy for about 12 hours to let it set. For example…a Deadliest Catch TV marathon. Next, you’ll go ahead and install the Speedplay cleats (yours) on top of that. 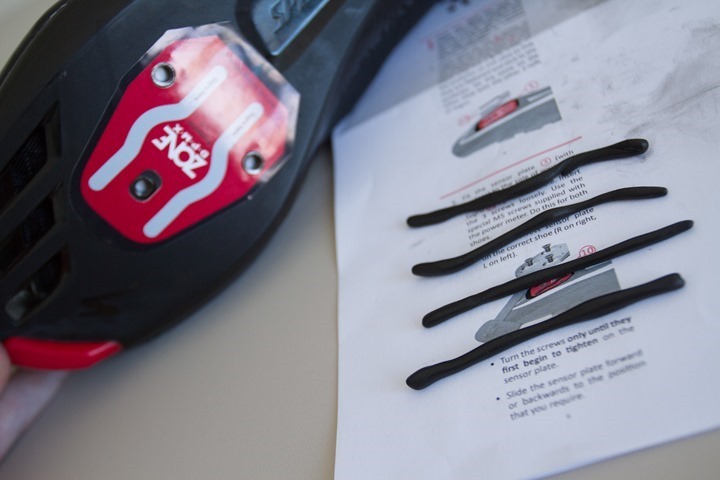 The whole process is really dead simple, and honestly not much different than simply installing any other Speedplay cleat. The only tangible difference is adding the glue and then having the pod hanging off the side. That’s it. 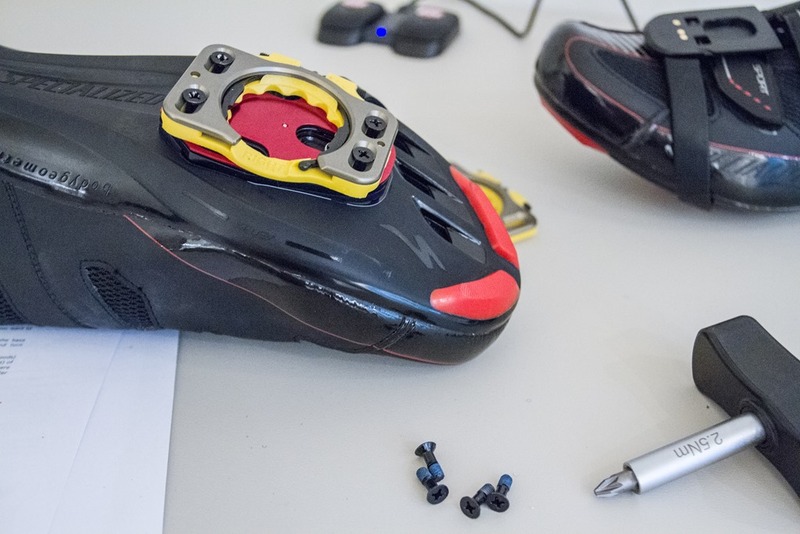 Finally, to calibrate you’ll rise up the back of the shoe on a flat surface so the cleat is level/flush with the table/garage/desk/etc… Then just triple-tap the front of the shoe. Don’t worry, this process is protected against accidental triple-taps in that it requires the shoe be held still pre/during/post the triple-tap. That’s it for calibration. Note, there is a piece of software that you’ll use to set the crank length. For me, this was preset (to 175mm, my crank length) ahead of time since the software is still being finalized. Then if it’s your first time using it you’ll go ahead and search for the power meter from a compatible head unit. That means as long as it supports the ANT+ power meter device profile, you’re good to go. For most people that’ll likely be a Garmin Edge or Multisport unit, a PowerTap Joule, or the like. Once it finds it there’s no further configuration on the head unit itself. Nor are there any additional configuration or calibration procedures you’d trigger from the head unit. Do note however that you would have needed to set the crank length within Zone ahead of time using the software (which I didn’t show here since it was preset for me). 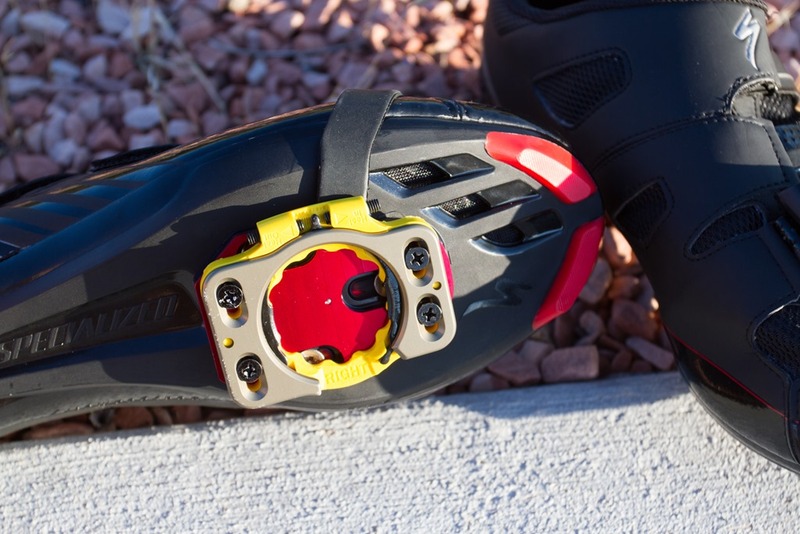 From there you’ll simply go ahead and snap into any Speedplay pedals out there. There’s no portion of the power meter that is installed on any bike. Everything is self-contained on the cleat and shoe. Once riding there’s nothing you need to do other than pedal. There are no mid-ride calibration procedures. 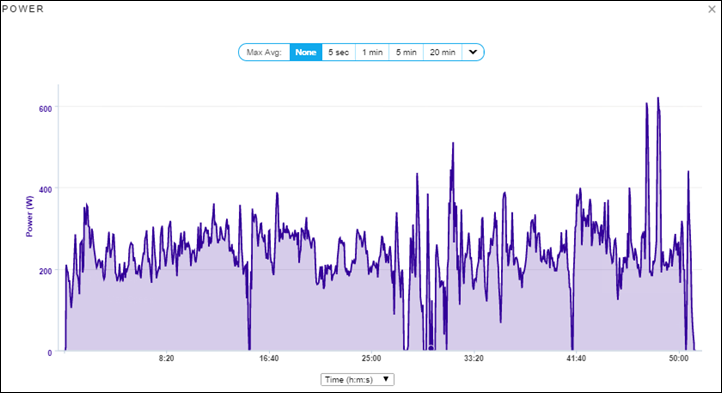 All of this is recorded onto your head unit as normal, and then available for upload to various third party sites or apps like Strava, Garmin Connect, Training Peaks, or Sport Tracks. The charging station just uses USB and takes about 2 hours to re-charge the units. When using the units if they have less than 2 hours of battery remaining they’ll give you a double blue flash every 2 seconds instead of a single flash every 2 seconds meaning normal battery and operation. To date I’ve only had a single test ride on the Zone system that Zone handed me to try out. The installation and calibration was done by myself for Zone, and the subsequent ride was on my bike with other power meters that I own. So basically, I installed and ran the test on a system that was fully mine except for Zone itself. For the test I went to Red Rock Canyon, about 30 minutes from Las Vegas. This is a 15 mile looped course that includes a fair bit of climbing. All of this data is then fed into two different spots. 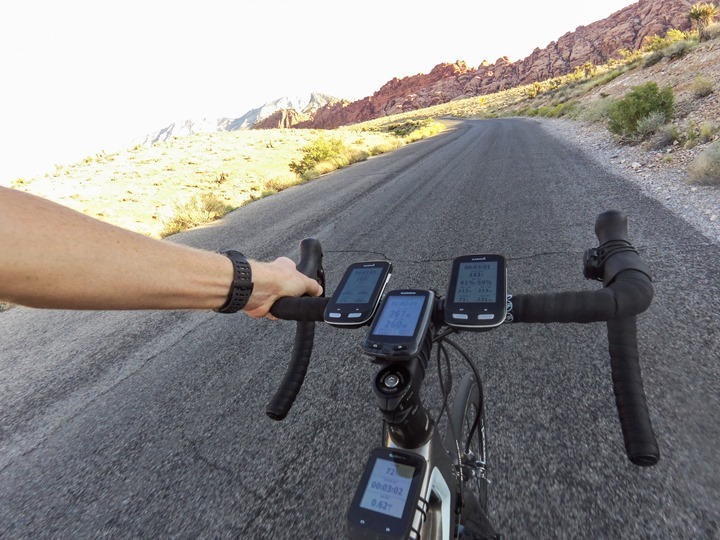 First is to a slew of conventional cycling head units, in my case the 2xGarmin Edge 1000 (Zone & Stages), Garmin Edge 810 (PowerTap), and Garmin Edge 510 (Quarq Riken). These units all act as ‘backup’ of my data. Second, it’s also fed into the much more important tool, the North Pole Engineering WASP ANT+ data consolidator. It allows me to seamlessly record everything as one coherent and complete picture. This removes the complexity of matching up files afterwards. The WASP then transmits to the phone via WiFi, where the data is recorded in real-time. Hmm. Not ideal. Brim is the one in orange that seems to be a bit all over the place. In some cases (like at about the 60% point in the ride), it seems to match perfectly. But otherwise, it’s a bit randomly high and low at times. Ideally you’d want it spot on, but at least if it was consistently high or consistently low it’s a bit easier to see how well it’s trending. This is actually an interesting case study in why you don’t just look at power averages or totals. 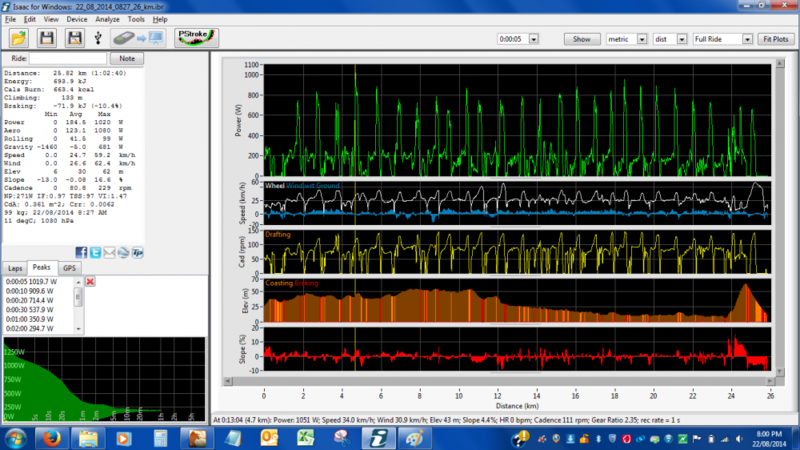 As all four power meters ended up with a normalized power within about 8w of each other. 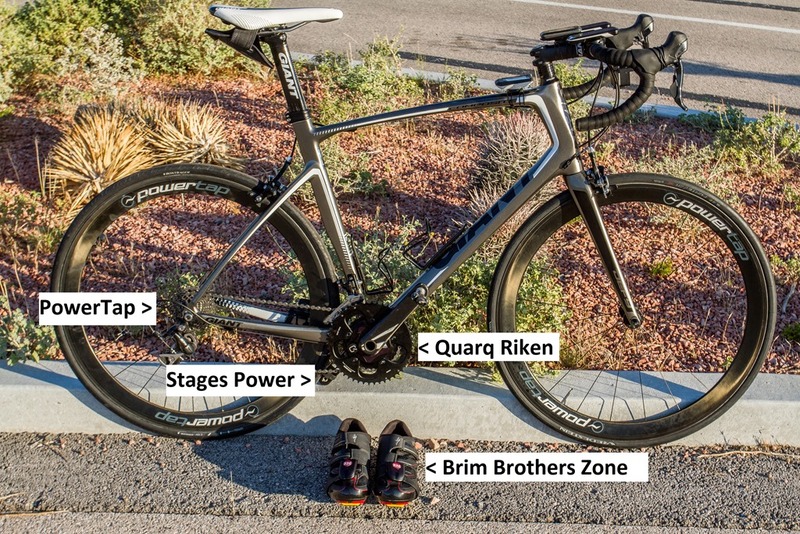 For example, here’s the Quarq (left) and Brim Brothers (right). Cadence is always a little bit trickier to compare because of how quickly an individual unit will react when stopping/starting, hence the drops you see. In general though – things seem to track pretty well against the other units. This will take a bit more digging into though. At this point, as one can see, it’s a bit tough to make any accuracy statements on Zone. On one hand it’s a near-final production unit on a first ride, and yet on the other it’s still not final – so things could change. After seeing the recorded data this morning, I met up with Barry Redmond from Brim Brothers to discuss the findings a bit. He noted that what I saw with the variability was an issue they’ve sporadically seen on a handful of test users, and they were working on a software fix to address it. It stems from some of the shear force being exerted on the pedals being incorrectly used in the regular ride power output. He noted that they won’t ship until the software update is implemented, which they currently plan for October. The raw data from the ride is available here, for those that want to analyze it. Or, you can look at the Garmin Connect file here for a simpler view. As usual, you’re welcome to analyze it and publish those findings elsewhere, simply link back to this post however. Below are some random details and facts, along with what I suspect will be the most common questions. 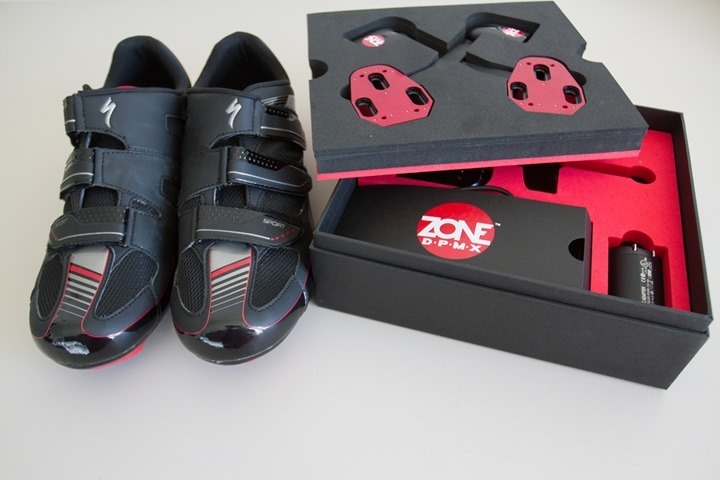 Pedal/Cleat Compatibility (general): The Zone DPMX is only compatible with Speedplay Zero Cleats, and Speedplay pedals at this time. Crank compatibility (general): There are no limitations on crank types/lengths/widths/materials/brands/etc… As long as a Speedplay pedal is attached to it, it doesn’t much matter. Chain and frame clearance: There are no limitations as far as chain clearance. The Zone power/communications pod connects on the outside of the shoe, not the inside of the shoe. Battery Life: 15 hours , then would need rechargeable dock. Weight: Additional 35g per shoe. I have not measured this yet independently. Weatherproofing: IPX67. Stated temperature range of 15°F (-9°C) to 140°F (60°C). I don’t recommend riding in 140°F heat however. Note that it doesn’t need temperature compensation, due to the non-use of strain gauges. ANT+ Connectivity: The unit is able to transmit via ANT+ to any other standard cycling head unit that supports the ANT+ power meter profile. Today that’s every Garmin cycling and triathlon focused device above $200, the PowerTap Joule, Timex Cycling and Triathlon units, Magellan Cyclo and Up units, and many others. The unit supports sending the following metrics: Total Power, Left/Right Power. They plan to add Torque Effectiveness and Pedal Smoothness in a firmware update. Of course, you must have a power meter head unit that supports those specific metric types. 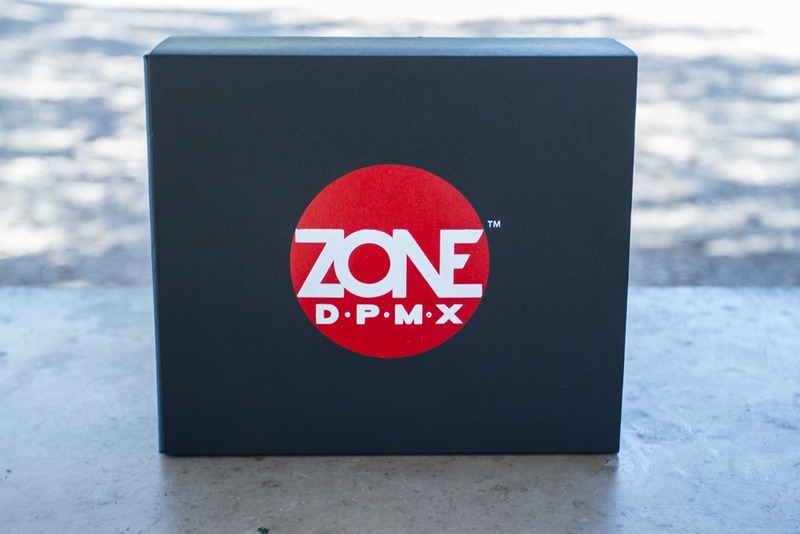 Pricing: $999US for the Zone DPMX (official name). This includes both left and ride sides. DPMX stands for Dual Power Metric (with an X). Shipping Date: October 2014 starting with the pre-order list, and then working from there. Looking at the power meter on the whole, the concept of having a non-bike-specific power meter is really quite ideal for anyone having two or more bikes, or for those that travel. My installation of the unit was super easy, which isn’t always the case for power meters. Obviously, I’ve got a lot more data to collect to make any determination of whether or not the Zone is a viable power meter. One ride isn’t really telling me enough yet to make that conclusion. I do however think there’s definitely room for a $999 fully left/right power meter that has no crank limitations. That would be a reduction of a fair bit from Garmin and ROTOR. And while it’s a premium of about $250US over 4iiii’s unit, one also has to look at lead times of product availability. Brim Brothers is much closer to production availability than 4iiii is (despite the data I saw today). Of course, I do believe that once reliable units hit the market in the lower price point, it will continue to drive the price down. Stay tuned for more data over time as I get more rides in on the unit, as well as perhaps get a better understanding of why I saw such variability on the ride. With that, thanks for reading! 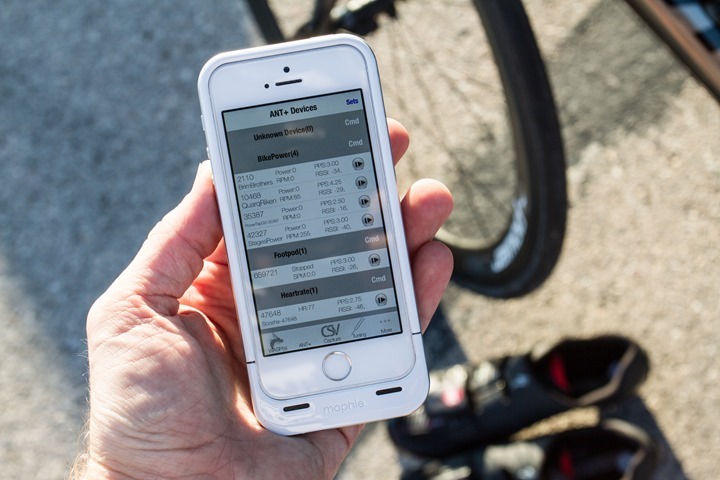 If you’re looking to burn a bit of time, here’s all my Interbike 2014 posts packed full of sports technology items. Can you confirm it is measuring the sheer forces that one would apply on the top and bottom (12 and 6 oclock) of the pedal stroke and not just the vertical forces that are applied at 3 oclock? It calculates shear force at every measurement point by examination of the relationships between the vertical forces measured by each of its force sensor elements inside the plate assembly. Nice since I ride Speedplays but $999 is the wrong price direction. I don’t either Ray, I don’t either. I know I’m late to the party on this one, but 140° F is quite likely. As pedals are nearer the road, and occasionally placed there while stopped on the bike, on a warm summer’s day the temperature will likely exceed that. Even if the cited temperature is in the 80s-90s F, the darker tarmac/asphalt will hold quite a bit of heat. I was really hoping that this would come in “dead on”. Especially with 4iiii’s $750 point (with the half-price option for one-side to see if you actually needed both-sides) and the $499 PowerBeat (although that may be the slowest to ship), coming in more expensively than an old faithful PowerTap is possibly unfortunate especially for something that’s not quite as accurate. Finger’s crossed that they’ll be able to ship you another unit in a few week’s that corrects these issues and moves them into the unequivocally recommended category. All of you guys saying it’s inaccurate you’re jumping to conclusions. It might be, or it might not – Stages wasn’t exactly perfect when it first hit the market …and this hasn’t shipped yet. That was more true a couple of years ago. These days expectations are higher, and as has been pointed out getting something “almost” right is a lot easier than getting it right. Note that the further-from-shipping 4iiii had none of those issues. MVPs in general are far less M than they used to be. The brothers have been working for years to get the power figures this accurate, so I fear it may take a while to get any significant changes. As I am on the Zone preorder list I hope I am wrong. I wonder why no results from the beta testing group has been released. Perhaps the results would tell us more about the accuracy of the product. What about Speedplay specific shoes with 4 holes? Answering my question, just look on their website and unfortunately there is no 4 hole option, plus it also needs shoes with at least an strap to hold the pods, which kind of makes sense. Anyway, I’m not giving away my new Sidi Wire SP, what a pity, hope they keep developing the product and offer more options in a near future. Do you have to recalibrate the unit through the everytime you swap to a crank that has a different crank length? All my bikes have a different crank length. Do you have to enter also your weight (as this affects the force exerted on a pedal). I can also imagine you can apply the force to the pedal without moving the pedal at all. Can this sensor filter this? Since power is defined as torque x angular velocity, when angular velocity is 0 (i.e. pedal is still), it follows power is 0 too. 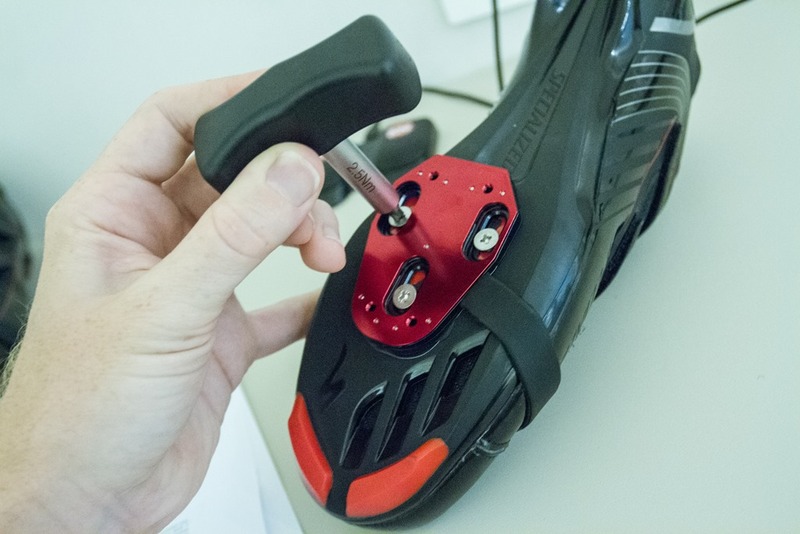 The actual force at the pedal and the cadence are measured, so weight wouldn’t be required and when you’re applying force to the pedal with no motion the cadence would report zero so the product of the two used to calculate power would be zero. While it’s speedplay only, is there an option for speedplay specific 4 hole shoes? 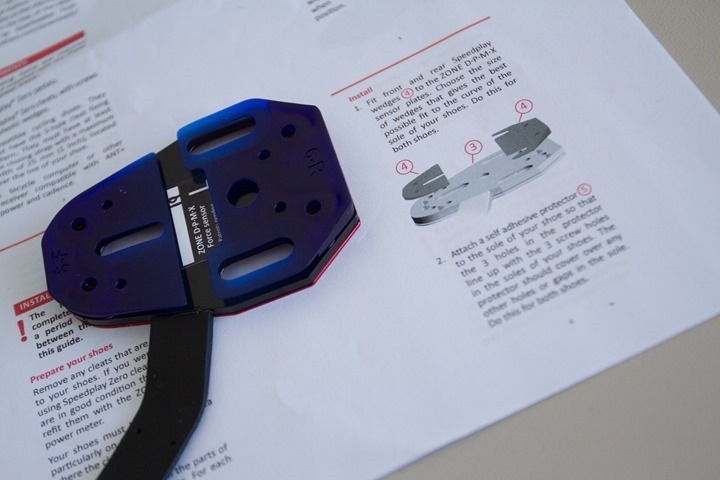 The force sensor plate requires the standard 3-hole pattern on the sole, so it can’t be used with shoes that have only the 4-hole pattern. The basic issue is that the sensor plate replaces the Speedplay base plate, but shoes with the 4-hole pattern don’t use the Speedplay base plate. Good stuff as usual Ray. Not to bury the lead here but do you have a post that describes the North Pole Engineering WASP ANT+ data consolidator. I’ve never heard of such a device!! Yeah, it’s more of a non-consumer device than it is a consumer-focused unit. It’s used in the industry primarily in health clubs and such for group spin classes, etc… My use of it sort of grew as a bit of a pet project for them, with them adding in little features here and there over the past two years. That said, it’s a massive time saver for me, and also dramatically increases the ability to get consistent data. I always assumed it must be quite expensive because my previous searches never brought up any mention of price. 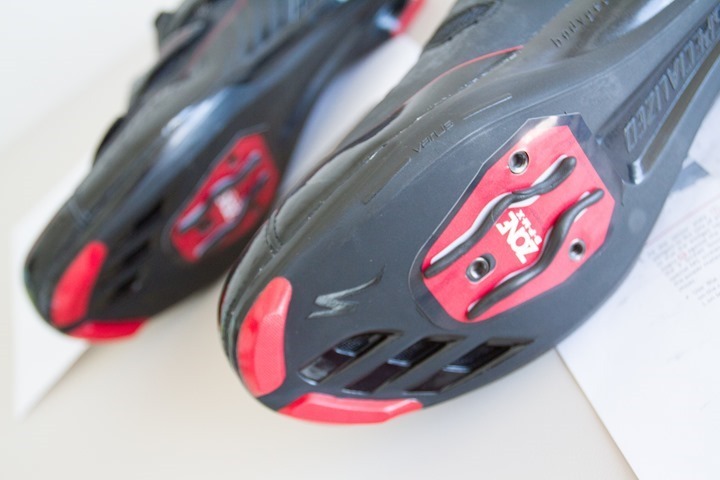 If, during a triathlon, I do transition to bike , just when you leave T1, and I need to “steep” into the shoes (I don`t know how to put it un the proper words xD) wouldn`t it affect the unit that goes attachted to the strap of the shoes? or I would need to start the bike with the shoes on? Yeah, I’m also curious for triathlon. 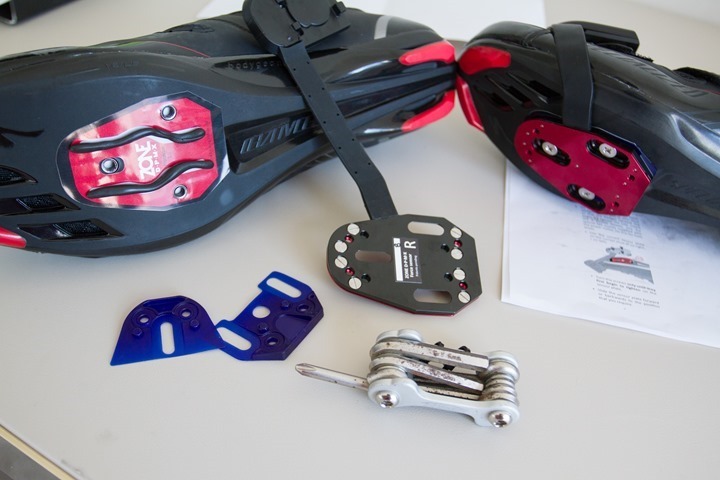 If you leave shoes clipped in, there might come a point where you will rest your naked foot on top of the shoe, either when mounting or dismounting. What are the chances of losing the pod there? I also assume that if someone wasn’t doing a flying mount, walking/running on the cleats is a big no-no? 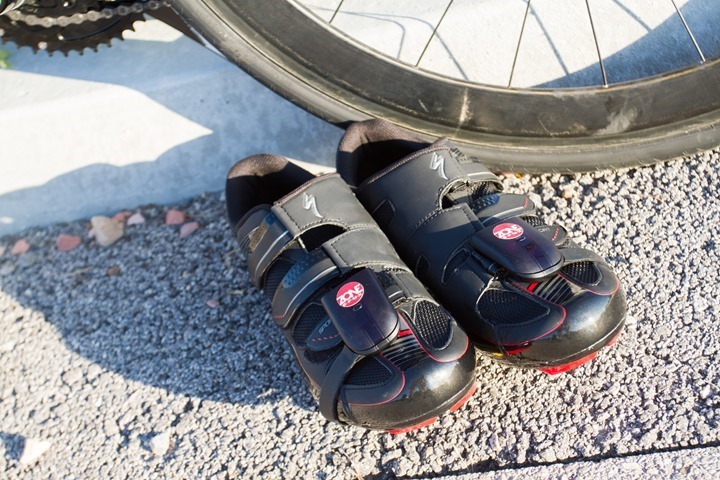 As a matter of fact, how resistant is the system to walking on cleats (say, you put your shoes in the garage and walk your bike to the road)? If each shoe pod also has to be turned on by pressing two buttons for two seconds, that’s going to make a difference in T1 too. Not so much for relatively slow long-course hobbyists like me, but enough to be a PITA (and easy to forget) on a sprint. You could simply turn it on pre-race and have it ready upon arrival. No different than calibrating most other PM’s pre-race in T1. Walking on normal hard surfaces does not damage the sensor plate at all. It’s built to be robust. How about walking on gravel/ something that might cause a stone/ rock to dent the plate? Also what’s your experience on mud/dirt/sand getting stuck on the cleat? Does it affect accuracy? I find my cleats to be often quite dirty, especially after walking/ running in the transition area. By this comment, I’m assuming that running with shoes in T1 on gravel / grass is not recommended? Oh, good. I was thinking that it’d automatically turn itself off in 5-10 minutes to save battery. Thanks! From a technical triathlon standpoint, it’s best to keep your feet out of your shoes when in T1/T2 (just for speed). From a logical standpoint of course, many people do that (for various reasons). From a product durability standpoint, Brim Brothers have said that’s not an issue. Is the unit compatible with BOA shoe fastening systems? He looks to be sitting right around a 7 on the chewbacca scale. 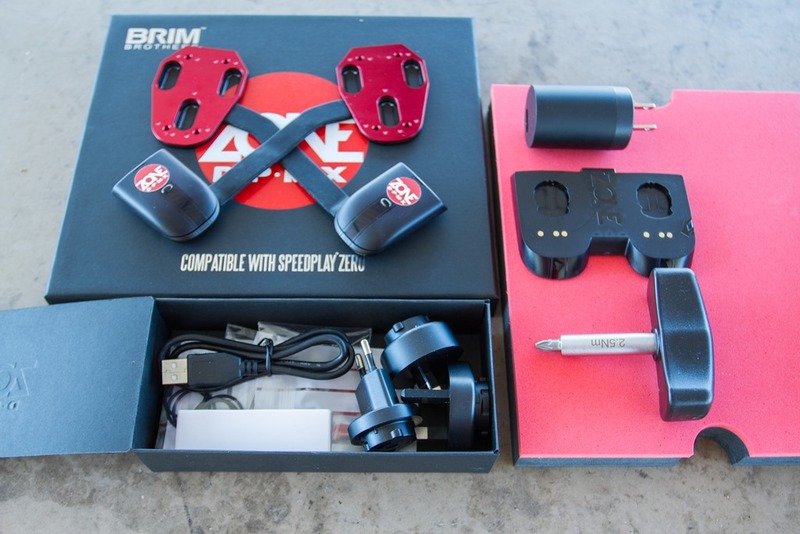 What’s the reason that the Brim Brothers DPMX uses USB charging instead of coin cell batteries? Clearly, it must have a higher current/power draw than other power meters such as Vector, but why? The Zone DPMX requires much more processing than other pedal or crank based systems, because the motion is far more complex. A motion sensor on a crank or in a pedal spindle (which is effectively locked to the crank) only has to deal with simple circular motion. 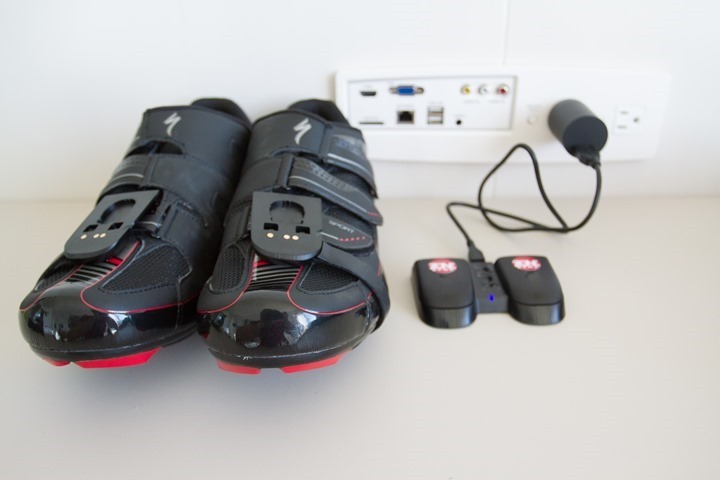 Our motion sensors are on top of the shoe so as well as the circular motion of the crank they are subject to the rocking of the pedal, which causes huge complications in the motion measurement. Extracting information about the crank rotation and the pedal rotation takes a lot of processing power. The unit measures over 100 times per second, so the time available to do each calculation is less than 10 mS, so the processor has to be driven quite hard to get it done in that time. That puts battery consumption up. You finally got new cycling shoes congrats. 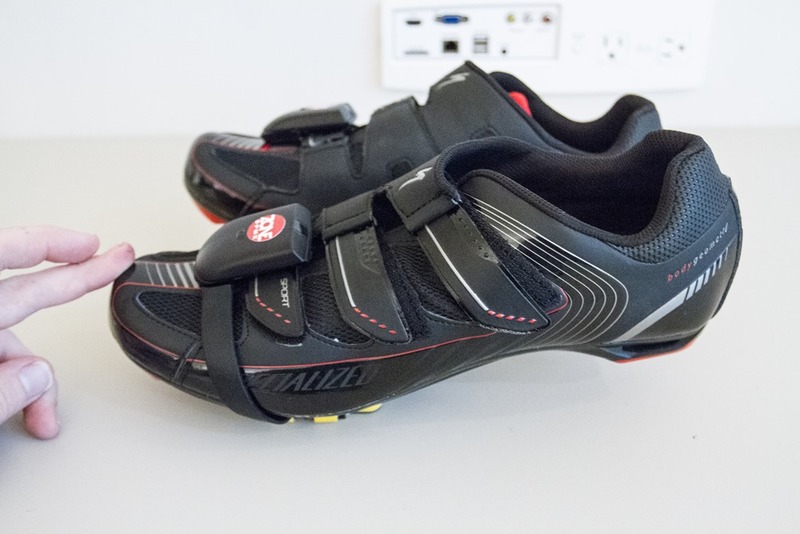 Not surprised that it fits you, the upper looks suspiciously similar to Shimano road shoes. Re: new bike. Funny that you have written so many words on all these things you attach to said bike to measure its output, but nothing about the ride itself. Its nice looking, btw. Did you retire the Cervelo? Nope, Cervelo is still in business. It’s just that with all these new power meters I was getting tired of either having to swap cranks/power meters, or being unable to easily (different bottom brackets), or, just being unable to work on multiple power meter reviews at once. This solved that a bit. 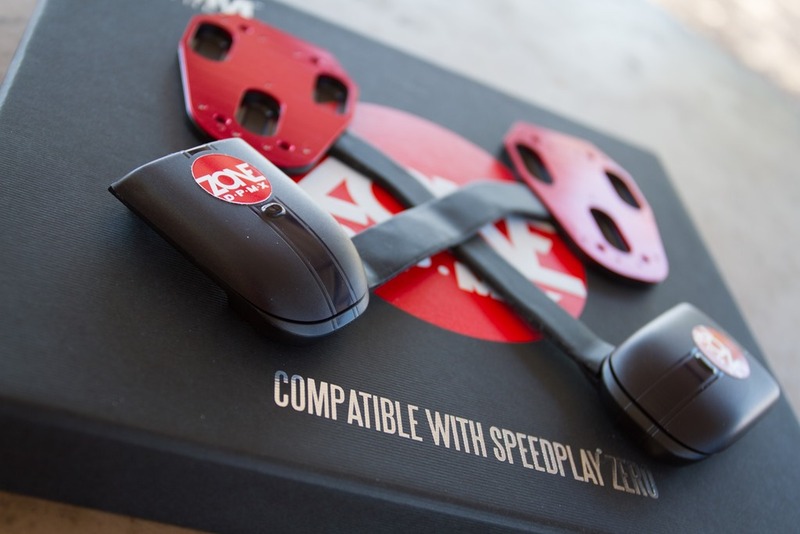 The box says “compatible with Speedplay Zero” – is it really Zero only? Not a problem for me as I use Zeros but may be a limitation for others. Also, how much is the Wasp unit and what software do you use on your iPhone to connect to it? Thanks as always, good stuff! Wow, all of a sudden, so many news about PMs! Ashton: 2016 is far too far off to compare prices. The thing is though, most Speedplay users are deeply committed to Speedplay, so they generally have their own pedals already. Yes DC, but the pedals are expensive and not included on the package. They are 127 Euros on Wiggle and that’s the cheapest Zeros. Checking the currency rate, Brim + pedals about 900€. Ok, not bad. They will get lower i guess. Since you mention the price of the pedals, I suppose you haven’t seen how much the cleats cost? If you don’t, make sure to take a look. Yeah, I do generally think though that the people who are going to (initially at least) be interested in Brim Brothers are those that are already invested in the Speedplay world, so that’s probably a wash. Absolutely right! I chose Speedplay for calculated, specific, extreme performance reasons. I would never buy a power meter that required me to use any other pedal — Vector is completely out of the question for exactly that reason. Ray, your Garmin Connect link gives a 404 error. Sorry, fixed. Thought I had set it to public, apparently not. This looks like exactly what I’ve desired, through the price has always been the sticking point for me. I’ll have to ad myself to the pre-order list, if they decide to open it back up again. I’m not sure to order mine. My number is under 100 so if you are interested to get it, and if it’s possible I can give it to you. Giant speedplay cleats are bleah. Walking around with those things on is terrible. And turrble (Cleveland Brown). I am concerned about the plate glued to the sticker on the shoe. It appears that you loose the ability to adjust cleats fore/aft ? I would like to see how hard or dangerous it is to remove from the plate from the shoe and reinstall possibly on a different brand shoe (changing plate wedges) and moving the plate up or back on the same shoe. You can still adjust fore/aft as you want. The silicone rubber material is very soft when you are attaching and adjusting the fore/aft position of the sensor plate. It doesn’t get in the way. Removing the cleat is easy. Just unscrew it as usual. The sticker will come easily off the sole of you shoe (it’s not very sticky) leaving it clean. Then the sticker plus hardened silicone rubber will peel off the back of the sensor plate. Any bit left are easy to pick off. 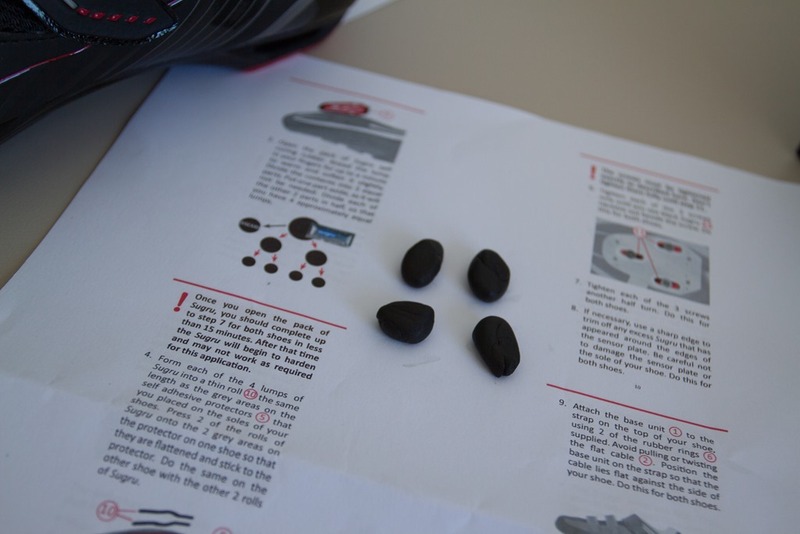 The silicone rubber is not really a glue, although it does stick to things. It’s used in this application to fill what would otherwise be tiny gaps between the sensor plate and the sole of your shoe, so that the sensor plate has a flat surface to match up to. This makes me dream of a day where the PM is simply part of the cleats. I can’t imagine why the connecting band runs on the outside of the shoe. In a crash, that part is much more exposed to damage than the inside. The unit has been crash tested (unintentionally) and survived without damage. 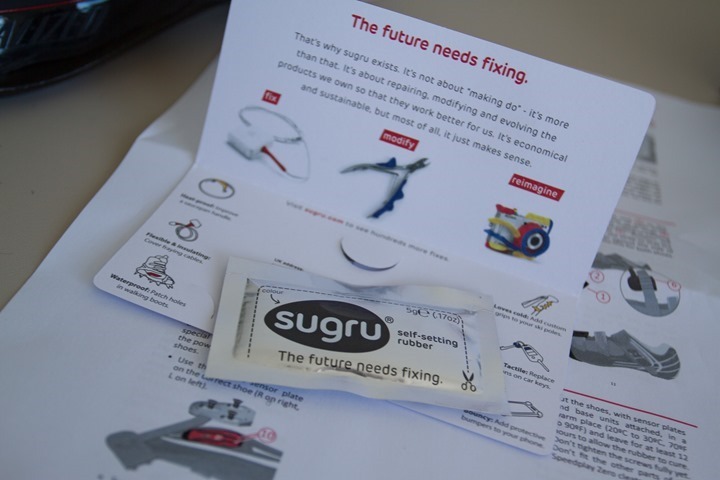 Why the need for the glue? I understand it will help keep things in place, but it is stuck to a sticker, does that really help? That said, it’s an ingenious way to make the ‘glued’ cleat removable. The glue (rubber really) helps to fill in the gaps between the plate and the show, since the shoe isn’t quite perfectly flat. The self-adhesive “sticker” does 3 things. It prevents the silicone rubber from sticking to the sole of your shoe, it has marks on it to show you where to apply the silicone rubber, and it covers any extra holes in the sole of your shoe to prevent the silicone rubber going into them. 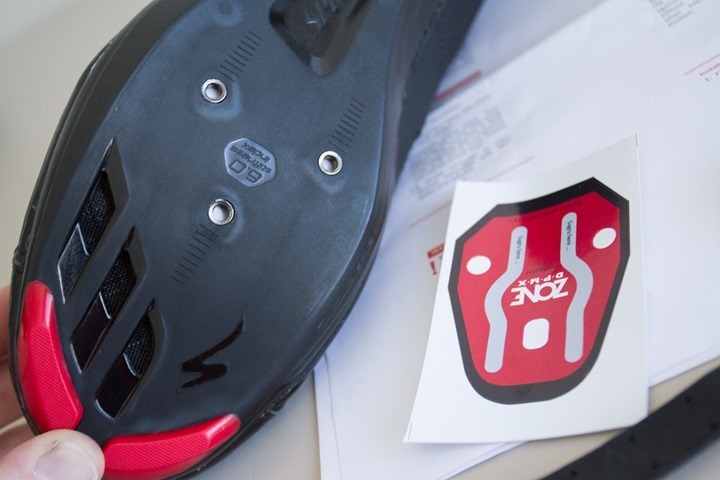 The purpose of the silicone rubber is to fill tiny gaps between the sensor plate and your shoe. It just happens to be sticky too. 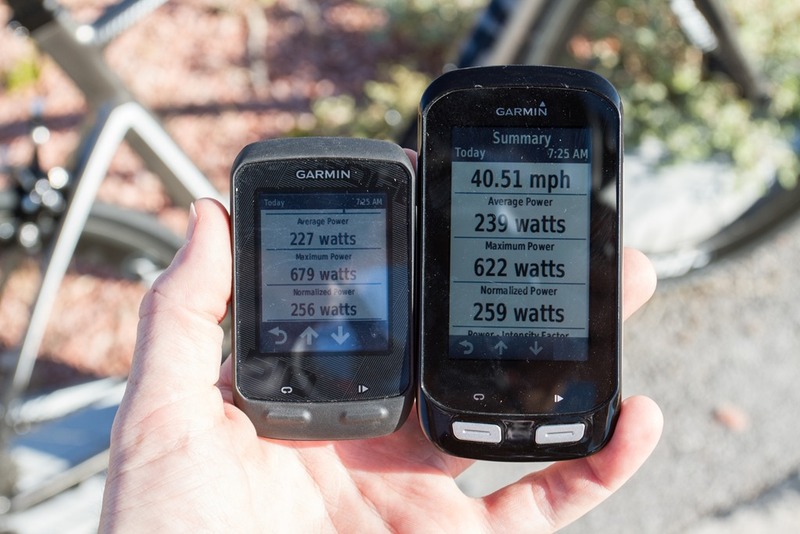 Meh…… I’ll stick with my P2M power meter(s) that I have had since their inception. Have been flawless to date! 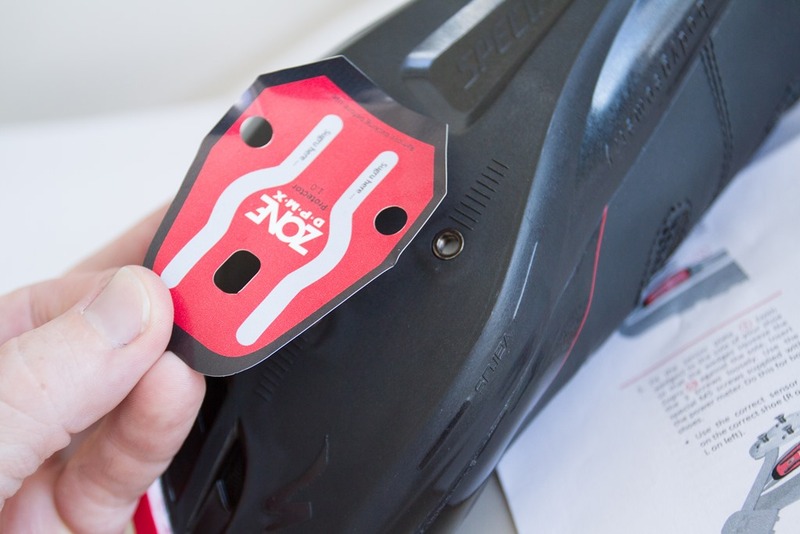 I’m just searching your pic’s trying to get a sneak peek at the 920XT on your wrist………..
That sticker… threre’s gotta be a way to use a sticker like that on a pair of shoes to help align a new pair of cleats precisely where the lld cleats were. 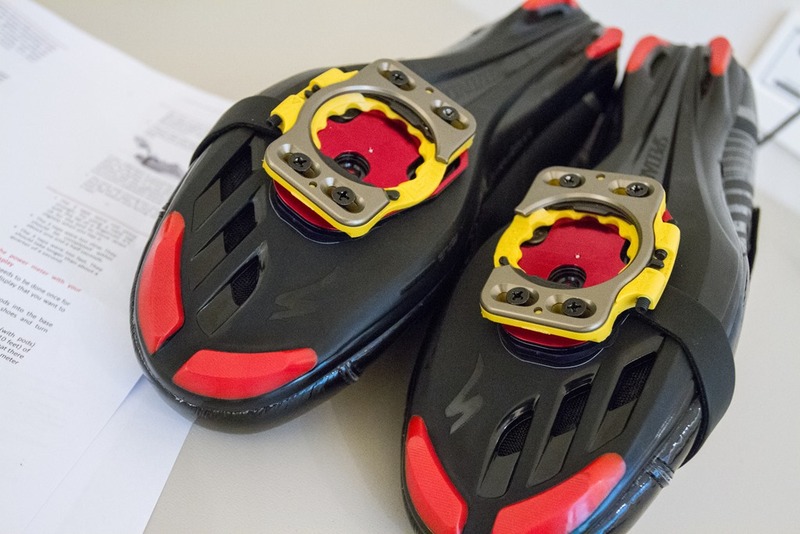 A bit off topic from power meters, but ill pledge to whoever kickstarts a sticker to help align replacement cleats. With SPD-SL, I stick a piece of masking tape on the sole so that it’s aligned with the back edge of the cleat (this gives me fore/aft and tilt) then using a pen or pencil make two marks near the ridges, so I can get the lateral offset right. 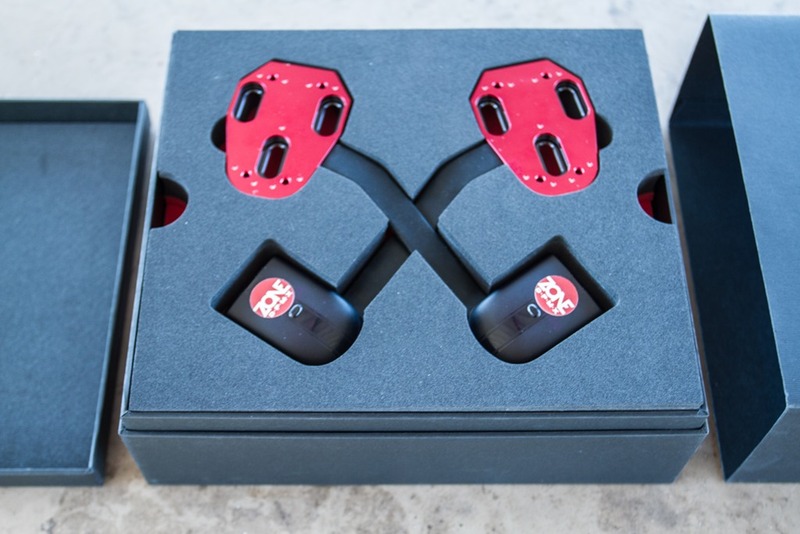 If you want something more fancy-looking, there’s cleat alignment tools. I’d like to see the iBike Newton in one of these comparisons considering it is at a lower price point and not one-legged. Quite happy with my unit. You’re right the iBike is not one legged: it’s no legged, because it doesn’t measure power directly but rather estimates it from other measurements. It might do a fine enough job, but any comparison to any DFPM is only meaningful to the extent of finding out how close the iBike can get to the numbers without actually measuring them. Just like the PowerCal I’d expect it to be relatively accurate when analyzing longer efforts, but I woulnd’t count on it being consistently close to reality on shorter timeframes. It might be useful but it’s not the real thing and honestly? with an asking price of 499€ I’d rather measure one leg than get an educated guess for both. Saying they “estimate” is BS, mate. They calculate using oposing forces. How accurate they can do it is the question. It’s a self-defeating argument: you know well it’s not a DFPM and you’re asking how accurate it is while pretending you aren’t. If you really had no concerns you wouldn’t be asking. Not making a lot of sense there, I’m afraid. What does “measure power directly” mean here? There is no way to measure power directly. Power is a rate which must be derived from other measurements. All measurements have errors, for a start. At the physical level, different strain gauges and piezo crystals will have slightly different physical charateristics due to manufacturing variation, and there will be further variation in how they are bonded to or interface with other parts of a powermet. Next, finite-precision digital systems sampling analogue measurements inherently introduce sampling error – unavoidable. I presume the “DF” in the DFPM you keep mentioning stands for “Direct Force”. Neither strain gauges nor piezo-electric crystals measure force directly. They measure change in electrical properties due to small changes in displacement around a small component of an electrical circuit. Even turning these electrical changes into some sense of the forces being applied to the bicycle component being measured requires extrapolation and even assumptions (e.g. the linearity of the electrical response to force through the component, the degradation over time of things like the bonding of the gauge or of the response of the piezo crystal). The forces measured aren’t just those of the rider, but of bumps from the road and reflecting forces. The signal must be conditioned, and processed to try distil out that portion that is most indicative of the rider’s input from noise and secondary forces – that process will itself be imperfect. Note: Pedal based powermeters are likely to have an inherently more complex signal to sort out than, say, crank-shaft or axle based meters. The crank rotates about itself, while the pedal sensor rotated about the pedal and also about the crank. What matters is which variables are measured, how often they are measured, with what accuracy, and the informational complexity of relating those variables to the desired measurement of the rider’s power. The biggest issue with the iBike system is that it does not measure the aerodynamic coëfficient. It has to use heuristics and assumptions to relate its measurements to rider power. There could be a large error. That said, if the aerodynamic coëfficient of drag (C_d) stays pretty much the same, i.e. the rider and equipment stay in the same configuration, the iBike Newton could deliver quite consistent values. I.e. its error could be quite constant. The Newton could overcome this by displaying its measurement in terms of the unknown C_d, rather than in terms of power. That would be a very reliable and very accurate number. Some of the issues in your “DFPM” is that power-meter sensors can age. Gauge bonds can age. Crystals can age. Production differences in bonds can introduce non-linearities, which some power-meter vendors might not calibrate for. The strain response of the component the sensor or gauge is mounted to can change over time, particularly for alloys. So your DFPM has assumptions too. Yes, traditional “DFPMs” should be more accurate. However, they are still not perfect, and not at all free of assumptions. The iBike approach is quite interesting. If nothing else, it shows that you can do quite interesting things by adding an air pressure sensor. E.g. if you combined an iBike style air pressure sensor with a more traditional drive-train powermeter, you could potentially calculate the C_d dynamically in real-time. That could be very useful information for training purposes for riders to optimise their equipment and position. It could help riders get tucked in, and it could help them keep their aero helmets in the right place. Is it a hardware limitation or software issue that they are not producing the pedaling smoothness/ torque efficiency data as vectors and rotor are? …sorry opened my eyes and saw you already tell it’s firmware related and will be added. Any cost on replacing a pod if it is lost or broken? We have no official price on that, but if you find yourself in that situation we’ll look after you. For triathlons I normally train in road shoes for comfort but race in tri-shoes. This will unfortunately not work. I have those same shoes along with Speedplay cleats. First pair of cycling shoes and clip-ons I bought… Looking forward to prices continuing to drop on PMs. Can’t justify the money just yet. New bike? Which Giant model is it? I have old look delta cleats and there is no reason to expect Brim to build a base plate for that old out of date cleats. (logic dictates that Shimano is next) but could I just use the speedplay plate with longer screws? Speedplay-specific but doesn’t support Speedplay-specific shoes. You need to have a strap. I run SIDI wire carbon vernice airs… I’ll be replacing them with the same, but speedplay-specific. 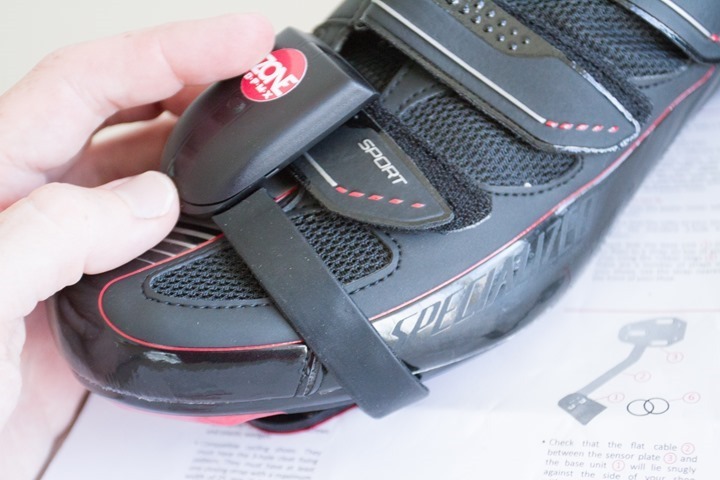 So I can’t mount the power meter due to having a speedplay-specific sole and no strap. Penalised for having nice shoes. Weird. I think you’ll find there are always outliers in any power meter solution out there, where certain incompatibilities exist. You can pick any power meter and I can list off places where things just aren’t compatible. I don’t think there’s yet one “perfect power meter” that works with 100% of 3rd party products in the cycling world. Absolutely mate, I don’t disagree and I didn’t mean to suggest that this aimed to tick the ‘perfect power meter’ box. I am however, still, surprised that being speedplay-specific that it didn’t go down the 4-hole mounting option as well, but I’m guessing they stuck with 3-hole to try and adapt later for all the other models of cleats. I am also still surprised they didn’t think about that pod mounting and the fact that people run wires instead of straps. Shoes are so ridiculously personal that once someone finds their ideal shoe and fit, they don’t tend to change. Keep in mind that the stacking height of your shoe changes so you might have to slightly raise your seat. Is it affected in any way by chainring choice, eg. the same as Quarq have inaccuracies when you use Qrings? Is it affected in any way by chainring choice, eg. when you use Qrings? 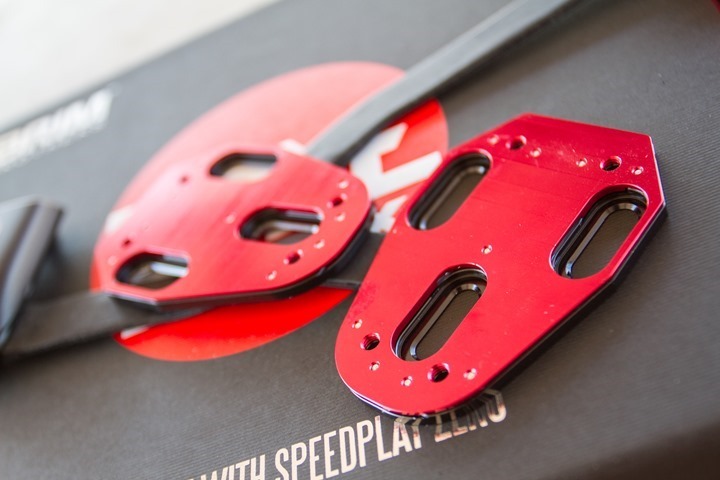 The Speedplay 3 to 4 hole plate develops grooves from the pedal floating after some use. I usually have to change the plate out when changing the cleat. Will this be an issue and can this part be replaced. Thanks. Does the stack height of the “power-meter” add enough height to the shoe platform that one would need to adjust the seat height a corresponding amount to ensure a continued proper fit? The pods look like they go well with shoes using a Velcro strap, but what about Boa style laces? I have almost all ANT+ components, already, but I need Bluetooth Smart / BTLE to connect to my iPhone. My simple solution is the Viiiiva HRM which has an ANT+ to Bluetooth gateway. It’s a very comfortable HRM and works with all of my ANT+ sensors, so no reason it shouldn’t work fine with the ZONE power meter. The Wahoo RFLKT+ also has an ANT+ to BT gateway, as another option. Any chance they make a left only unit available, for an affordable (half) price anytime soon? It would be nice to know the price for the European customers. Hopefully not simply 999 eur as usually. Is there anything like the wasp that you use for BTLE or standard BT? No, unfortunately not that I’ve seen. Ideally they’ll add BLE support to it (no much use for regular BT). Would consistent readings not require you to tighten your shoes the same amount each time? I would assume that if I had my straps slightly looser the second time, it would give slightly more flexibility on each pull phase, giving a slightly different reading to a tighter strap? I could be way off here, it was just a thought? No, because the force on the plate would ultimately be the same. 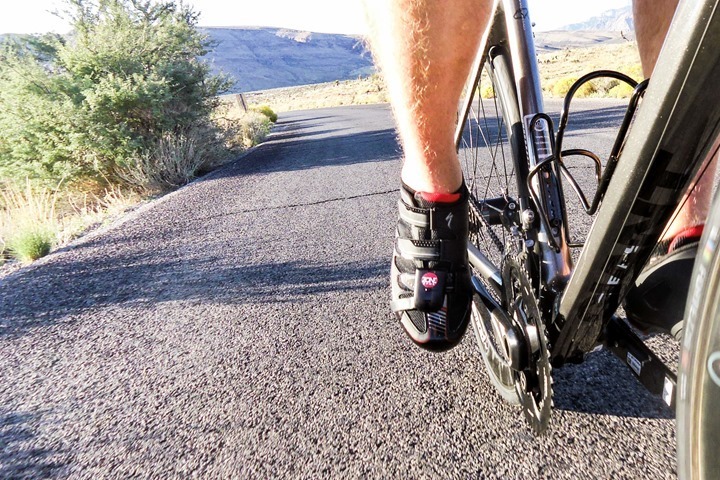 Your efficiency factor (if such a thing) would potentially vary, since you might lose some of that to the shoe due to lose straps, but the actual power exerted onto the bicycle would be whatever it is. If I understand you correctly, the power exerted by your legs may alter, but the power recorded would read the same. Correct me if I’m wrong, but my understanding is that the Zone powermeter doesn’t and can’t measure the pull on the pedal. I’m reasonably sure they can, since they can pull some of those metrics noted above in the FAQ section. I’ll double check. It seems to me it could measure up and down. Though, that’s something I’d be interested to get clarification on too. I gather each plate has 2 force sensors. I’m guessing they’re either orthogonal in the 2 larger dimensions (i.e. measuring displacement in the width and length of the main surface of the plate), or they’re parallel and measuring bending at each side of the plate. But I don’t know, and it’s an important detail. Looking at the plate and cleat, it doesn’t seem like there’s any way for a shoe to exert an upward force on a pedal without that force going through the cleat. The system also contains accelerometers (I would assume in the electronics of the shoe pod), so the pod can determine where in the rotation of the pedal it is. So, it seems the plate should see forces through it on upstroke, and it seems the pod should know whether it is going up or down. On that basis it should be able to measure something. It’s unclear to me though whether the Zone could tell the difference between a positive pull up on the pedal, or resistance against the pedal (i.e. a down force as the pedal goes up). Arg, correction “without that force going through the plate”. Oh, the other possibility for the sensor configuration in the plate is that one sensor somehow measures displacements in the narrow dimension of the plate. If it did, that’d be impressive to me, though I suspect it’s less likely (but I don’t know much about the mechanical stuff 😉 ). Yes, please double check this. If it can’t measure Pull then it’s no good to me. James, yes you’re right. The Zone DPMX does not directly measure pull up in this version. The firmware estimates the pull up using other information from the force and motion sensors. Research we’ve read indicates that even cyclists who pull up strongly get only a small fraction of their power from that, so if we make a worst case 10% error in estimating the power in that phase then it represents a tiny error in overall reported power. Hi, when you say not in this version, is that v2.0 or an update to the firmware? Looks like they will work with fixed gear (track) bikes based on the calibration protocol. Is that correct? Really want a powermeter I can use across my Road, Tri/TT, and Track bikes and I’m a Speedplay user. Would need to adjust the crank length depending on the bike, but no calibration update required? Correct, calibration is purely a function of putting it on a flat surface and giving it a triple-tap. 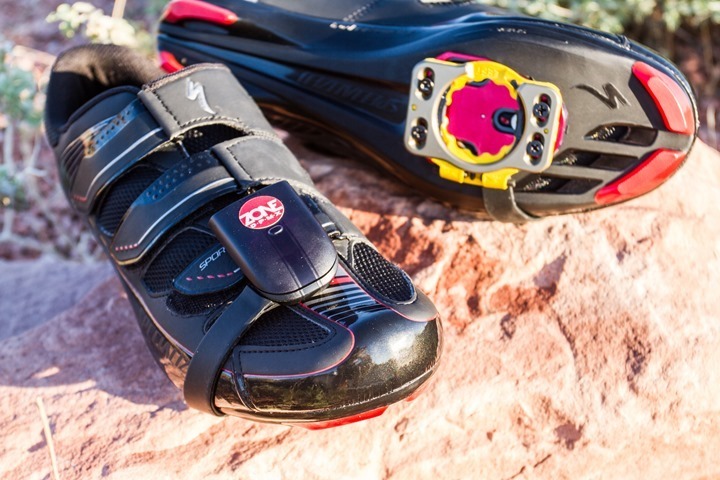 What does the foot pod attach to on the shoe if you are wearing tri shoes with one just one strap? I would be interested to know how these would work with Powercranks (left and right sides of the crank arms move independently and are not permanently 180 degrees opposed). Since Powercranks require you to pull up with each leg to complete each revolution, I wonder how the Zone plate will deal with this (viz James Kylemore’s question and Paul’s question). Meh … not good enough. Think I’ll get the Garmin Vector they look awesome. I have perfected the ideal 180 deg. TT pedalling power stroke which starts at 11 o’c with the equivalent of 2 o’c crank torque and continues with maximal torque through 12, 1, 2 and 3 o’c and natural decreasing torque at 4 and 5, would your PM be capable of verifying my claims ? Finally after a two year long wait for the Zone, the delay notices and the additional expected delay due my pre-order list # between 1k and 2k, I went for a pair of Vectors for the HT Winter season. Expensive but working well. Sorry bros.
Are the pods able to transmit through insulated over-shoes? I use Gore quilted over-shoes with multiple layers of fabric and insulation. Is there any restriction on fore-aft adjustment once the sensors and shims are ‘glued’ to the shoe? Are they suitable for use with non-round chain-rings, and a recumbent riding position? What’s the expected release date? The power meter is ready!! I mean … will be ready …. this year … err next year … well it’s ready now but …. errr … we will be sending them soon … bear with us here …. just need to adjust a little bit more … and as soon as our engineers get around the corner we will be announcing our re-launch of the product …. and you will be glad to get it under your tree next year… (it’s almost next year anyway) by then “hopefully” there won’t be any more issues or delays … off-course this is hard to guarantee but we are still accepting pre-orders and hopefully … hopefully …. I was pretty pumped about this product especially as it is Speedplay compatible. The review has made me a little apprehensive about going ahead with my preorder to be honest and i’m thinking i’ll just go with something more established but cost effective. The other down side for me is that I’m ranked 2000 or so on the preorder list and April is the current guesstimate for the delivery of their first batch out so basically probably won’t get a look in till June. With my pregnant wife due end of june and likely financial castration thereafter i need to shell out for luxuries like this pretty swiftly so it’s forgotten by then!!! Have to hand it to these guys for sticking their necks out for thorough testing and prepared to get it right though. if i had the coin to support them simply on those grounds I would do so. Hi, will these be affected by shimming one side to correct leg length fifferences? I would first wait to see if they can get it going at all before trying to shimmy it. Has anyone on the pre-order list received a purchase invitation from Brim Brothers yet? The January 17th update said that purchase invitations would start going out in mid-February. I have a number under 100 and I have received nothing for the moment. If anyone is insterrested by my pr-eorder I can give it. I am number 70 on the list and have heard nothing so far. I am thinking at this point I should not have sold my stages power meters. I have a number under 70 and am starting to look elsewhere. Disappointed that they have not provided any additional info about what is going on and hope they will provide some news so I can make my decision. i’ve moved on and bought the Vector S pedals and i’m pleased with them. I’d wanted speedplay pedals but its not to be this time. Finally heard from Brim Brothers. No surprise, but release is now going to be further delayed until September. I already went with Power2Max a month ago. I wish that brim would be more realistic and truthful as now I am without a power meter. They have let me down 3 times already. Not available yet, and won’t be delivered to 1st customers until close to the end of this year at earliest. We uncovered a significant mechanical problem during field testing about 6 months ago and have been addressing that. We now have to repeat field testing and some production tasks, which takes time. We’re being very careful with public commitments right now, until we are absolutely sure the product is ready. We have a “pre-order” list (actually more like expression of interest) but even if you add yourself to it now it’s unlikely you would receive delivery before 3rd quarter 2016, although there are still reasons you might decide to do it anyway. I appreciate their candor and wish them well, but I won’t wait. The whole power meter landscape will likely be dramatically different a year from now. I got the email today also. I’m somewhat tempted since 4iiii have backed away from any commitment to backward-compatible upgrades to dual sided, but I use Speedplay Ultra Light Action pedals and Brim Brothers are not committing to anything other than the Zero’s at this time. I really would like a pedal-based system though…. I’ll wait to see what Ray says after production units start arriving and also watch for Brim Bros. announcements about compatibility with other models of Speedplay, including the ULA’s. I went for the single sided as they offered a 100 discount on future purchases which I figured I could use if I want to update to a dual – currently I have a powertap on my winter bike and a Quark on my regular road bike and will compare before spending the extra on the dual – I really like the idea of simply picking up my shoes and getting power on any bike with zero swopping of parts – I also plan to test with the speedplay x peddles as they are compatible with the zone however untested by Brim. It was €780 for the dual-sided version, plus whatever the shipping cost was to the country you wanted. In my case, the additional cost for shipping to the UK was €24, bringing the grand total to €804. Note that they will NOT be shipping everywhere for this particular run. They state explicitly that they will ship ONLY to US, Canada, EU/EFTA, as well as Australia and New Zealand. And the new features do they worth (left leg only)? I haven’t tried the new unit yet, though we’re chatting about getting one to me rather shortly. It is somewhat disappointing that after such a long time being told I was in line to order a product that it turns out that actually I was in line to make kickstarter donation for a product not yet in production by a company that needs additional capital to get that done. I was was ready to buy not make a kickstarter payment. Are there plans for this product to become compatible with other cleats than speedplay? I agree…very odd to have a Kickstarter for a product that is supposed to be ready. I suspect their manufacturer is requiring some up-front payments for materials for an economic order quantity. I’ve been waiting for years, and even though I don’t expect the best out of this product (no power measurement pulling up, which isn’t a big deal for most, but is for me), the convenience of having just one power meter for the 4 or 5 bikes that I ride makes it worth a try. I’ll compare it to my Powertap and then decide which to keep. My vague understanding is the cleat plate that’s measuring strain has been significantly redesigned from the version Ray/DC tested a year and a half ago, to close the accuracy limitations that were noted. It will be interesting to read the test of the updated DPMX. Pricing is just very confusing, esp for Europeans. They advertise 880/440 eur as normal prices on their website. In my understanding European consumer prices always include VAT. Irish VAT is 23% I think. Now they are selling/ shipping from US through the kickstarter campaign, so the kickstarter prices are VAT 0%. If/ when customs picks the package up, we in Europe will end up paying our own country’s VAT + possible customs duty. This they tell on the kickstarter page on a general note. So to me it seems they have wrong prices on one of the sites (their own or kickstarter). Really hoping the new version is accurate, would buy if it is. Kudos to Brim for not giving up/ going bust, can well understand the need to use kickstarter at this point. What i don’t get about the pricing is that the Brim brothers have kindly agreed to give early adopter 100 euro discount for future purchases. It therefore seems to be cheaper to get the single sided pedal for now and get the 100 euro discount for the upgrade than buy the dual side now? or maybe my maths is wrong. I had popped for the dual pedals but looking at above have changed my order. Have seen several comments that the Zone is “outdated”/the market has passed them by? In what regards? Bluetooth-support? Accuracy? Mark says they don’t support power measurement pulling up. What does that mean? Less accurate measurements? 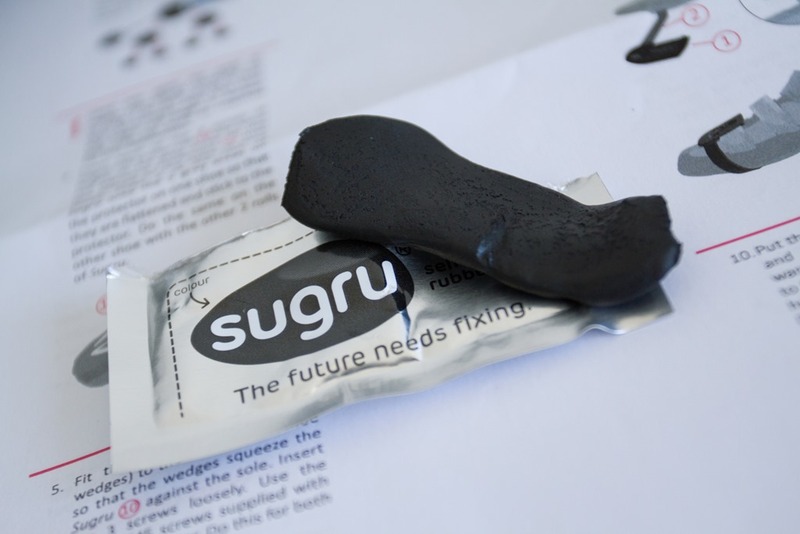 Installation no longer uses Sugru? From a prior review (or maybe it was in the Q&A on their website), it was pointed out that since the plate under the cleat is measuring compression force, when you pull up on the upstroke, there is no downward force to be measured as all of the force is upward. For power meters that instead measure at the crank or hub, that isn’t an issue. (It’s not clear to me if Garmin Vector pedals overcome this issue, but I’m guessing they do overcome it via their pedal pods.) I’d guess that for most riders, they are generating most of their force on the downstroke, so it shouldn’t be a huge issue. I’ve adopted what I believe to be an unusual uphill standing sprint style where I generate most of my force on the upstroke, so I won’t get good measurements on my KOM attempts. Well, these things measure deformation – not force. The version DC tested didn’t measure whatever deformation upstrokes were causing – or at least, if they did they weren’t able to differentiate them from other signals. However, the upstroke force *must* go through the cleat, and it will bend and deform slightly. Just in different planes and/or senses to the downstroke. There’s not an intrinsic reason why that can’t be measured in the cleat. My understanding is that part of the changes made involved changing (at least) the geometry of the strain sensors on the force plate. Should be interesting to hear from Ray on this when he gets to test. Oh, and by “these things” I meant to include “, like pretty much all “direct force” bicycle powermeters”. The Zone DPMX does not directly measure pull up in this version. The firmware estimates the pull up using other information from the force and motion sensors. The lack of accurate up stroke measurement was a limitation in the force plate of the cleat, is my understanding. The force plate has had significant design updates since. Whether the model they’re going to ship has fixed it, unfortunately I do not know. It’s an interesting question. Still, as Barry says, the upstroke force is at most a small component of the total power for most cyclists. Further, for any given cyclist, I’d guess it’d be a consistent amount over a ride – so measuring the major forces should still be pretty good for training. On that basis, I went and backed it. It will be interesting to hear the definitive answer though. The fact that DCR didn’t get an advanced look at the new product also gives me a little pause. It sure would be nice to have some independent validation that the prior issues were addressed. With that said, I think I was in the first 50 or so to order, so I’m in however it works out! In the end, I find power meters most useful for 1) knowing how hard I can go pulling the paceline before my HR will catch up to my effort, 2) power zone based interval training, and 3) use on a trainer…especially in conjunction with Trainer Road. For any of these cases, I’m pretty comfortable this will work fine. Fingers firmly crossed. We actually discussed it back and forth quite a bit over the last few weeks. They only had so many units on-hand, and they needed them for the campaign shoot/videos. Additionally, the units they had didn’t include some final changes that I was interested in validating. That unit in theory arrived today to them, so I’ll circle back with them here in a few mins and see if it’s still on target for getting to me next week. I’m not too worried at the moment, I chat quite a bit with them – and they seem keenly aware of the issues they had in the past. Really, the only concern I have is that this last manufacturing push (since essentially everything is done) won’t run into any snags. A 2.5 month timeline basically means they’re just pressing go on final prod units in bulk and that everything else is done. As such, there is little room for error. Great, I’m happy to hear that you’ve been in touch with them and will hopefully have your hands on the latest version soon! And I agree…it seems very appropriate to temper any enthusiasm about a delivery date. I’ll hope for sometime this summer, be pleasantly surprised if it’s in the spring, and reserve any potential disappointment for the fall. Have anyone considered that Lithium batteries are “done” within 2-4 years? If Brim Brothers do not replace batteries, whole unit will be expensive brick. Most aren’t though. Batteries don’t just go from hero to zero at at magical point in time. Battery life is usually tied to re-charge cycles – often in the 500-1,000 cycle range. So in the case of this, that’s a heck of a lot of riding for most people (1 cycle = battery length, so however many hours that ends up being per cycle). Next, batteries typically start to lose ‘luster’ after that point in time. For example, it does’t go from 100% to 25% capacity, but could go from 100% to 90%, or 80%. But usually that progression is slow. However, none of that really matters, because the battery pods simply pop-off. So after 5-7 years or a thousand charge cycles, you simply buy a new battery pod and you’re good to go. No need to buy a whole new unit. Totally agree with DCR. I used to be a leader on Ford’s hybrid vehicle programs and learned a whole lot about Lithium ion batteries. The main thing I would add to DCR’s comments is that you should charge your lithium ion batteries very frequently. I’d suggest making it a normal part of your routine after every ride. Draining your lithium ion battery to 0% once is much, much worse than draining your battery by 20% five times. So with partial discharge and frequent recharge, you’ll get way, way more than 500-1,000 uses out of the batteries. The Zone has a claimed battery life of 15 hours, which is the same as my old Garmin 705. I used my 705 for 6 years, logging about 5,000 miles and 150 rides per year. That’s about 30,000 miles on 900 rides. At the end of 6 years, I had no noticeable degradation of the battery, and would come back from centuries with ~ 65-70% battery charge remaining. I sold it to my buddy, and he’s put 2 more years on it and hasn’t had any issues. Bottom line with lithium ion, charge frequently for the longest life. I have read that charging to 100% can damage lithium ion batteries and it is preferable to charge to 90% only. 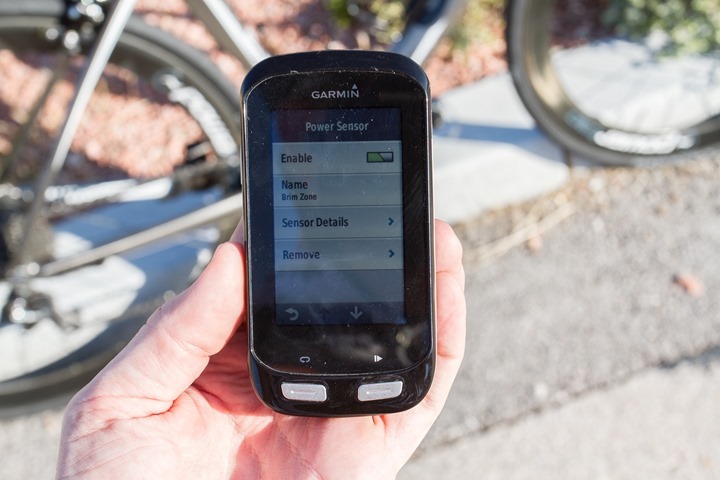 Did you charge your garmin after every ride? How long did you let it charge? For longer term storage, completely accurate that a 100% charge will degrade your battery. If you are using it daily or every few days, keeping it fully or nearly fully charged is much better than letting it cycle down to say 30% charge before recharging. In a perfect world, charging to 90% every ride would be ideal, only going to 100% when necessary. The practicality of watching the charge to determine when it’s at 90% takes that option off the table for most of us. 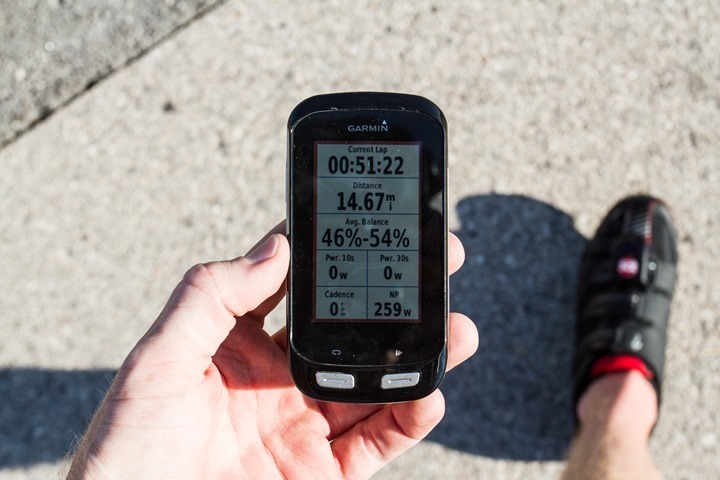 With my Garmin, I charged it overnight after every ride…no special attention required. Also, by bringing it inside to charge after every ride, it kept the battery out of the hot car or warm garage. Heat over about 85 degrees also degrades the battery, as demonstrated by some electric vehicle batteries in use in Arizona. That explains why we have issues here. Riding at over 85 degrees is required here in Texas. In July to August the low temp for the day is about 80. 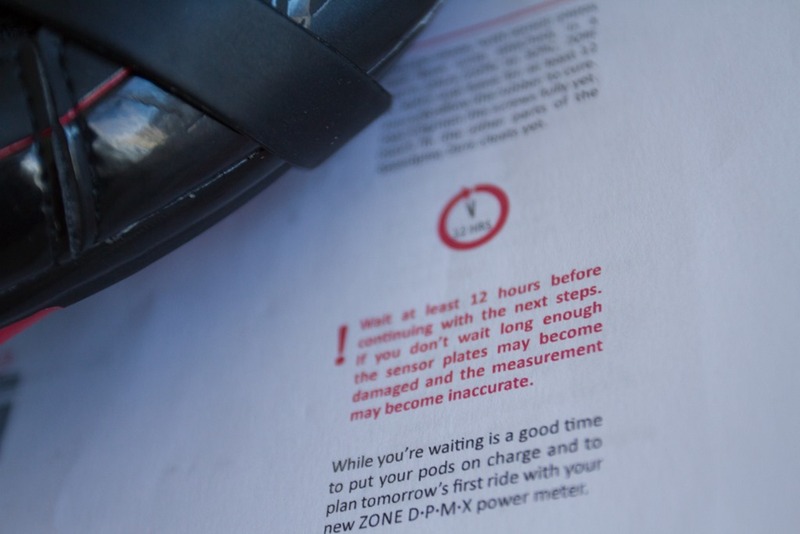 If the average ride is a couple of hours, I’d expect thousands of rides before deterioration should be an issue… if you charge after every ride. I did receive a unit on Thursday last week. However, we ran into some issues with the cable connecting it to the pods (it lacked a protector piece that’ll be on final units, so it wasn’t as protected), which subsequently caused error codes and power issues. They’re getting another units swapped out, though I’m travelling the next two weeks, so it’ll be down to the wire before the Kickstarter closes. Both them (and I) are definitely aware folks are trying to base decisions on it before the campaign closes. The lack of unit prior was mostly to allow me to be on a later built unit than what was ready pre-campaign (thus in theory closer to production quality). Maybe they don’t won’t you to figure out how accurate or not is the power meter. Ray – Have you had a chance to review the current version of this product? Not really. I had a near-final version back a month ago, but due to being hand-made it suffered a near immediate death and one of the cables got frayed, so I wasn’t able to get in more than a few minutes of testing. After years of promising a powermeter the best they can give you is a handmade one that fell apart?? Hmmm some serious company behind this product. I think that after using you for years as a marketing tool, you deserve better. It appears there is another delay in the release of these power meters. I’m on the Kickstarter campaign, and anxious to try the Brimm Brother’s unit, but sure am glad I already have P1 pedals to use in the meantime. Oh dear … How serious is Indigogo?? they are producing the first batch for delivery. Did you recieved an new example for testing? Not quite yet, but we chat from time to time. So I expect once they have units in-hand, they’ll plop them across the channel to me. More of the same… delays, delays, delays. At this point, I consider my Kickstarter contribution was simply a charitable donation to this project, and in no way expect a working/functional power meter. I suppose that’s the difference between Kickstarter and actually “buying” a product, but its frustrating nonetheless. In the end, I am glad to have units from both PowerTap (P1) and 4iiii (Precision) installed and having performed wonderfully all season long. There’s no story long enough to explain away these kinds of delays from Brim (years — since this product was first unveiled). Manufacturing and global sourcing can be/is complicated, but not this complicated. And before I’m accused of being an internet troll, I do sympathize with Brim Brothers and the production issues they have faced. I hope they eventually have a great product that rips the market wide-open. Really, I do. To get there however, I suspect they’ll need significantly better in-house experience with the manufacturing processes of this device — and probably a new method of setting investor/customer expectations. With great sadness I have to tell you that Brim Brothers is ceasing operations. We have run out of time and money. The difficulties we have had with production quantities, together with variable accuracy of the finished units when in use, mean that we are unable to deliver and we don’t have the resources to continue. Over the last couple of weeks it has become clear that putting an innovative product into manufacture has more challenges than we planned for, particularly achieving the consistent accuracy that a power meter requires. Our first production batch demonstrated that more time and investment is needed to test and re-test new production processes. This is beyond our resources, and our efforts to find new finance have not been successful. What this means for you as a customer is that we can’t deliver your power meter, and we can’t provide a refund. For me personally this is what hurts most, and I wish there was something I could do to change it. We attempted to create the most innovative power meter in the world, the only wearable power meter, and in doing that we probably took on bigger technical challenges than any other power meter design team. Over the last 8 years we solved so many of the challenges, and created new technologies, but we have fallen short at the last hurdle. We very nearly made it. To our customers, our employees, and the many people who have supported us in so many ways I say thank you, and I’m sorry we couldn’t deliver. I agree MellowMiles. I’m surprised by this but I guess seeing them trying to fund on KickStarter should have been the red flag. Expensive lesson learned. Seems the Brim brothers company is closing down… and nothing refunded to the backers. that’s the risk with kickstarter. nothing is a guarantee. you’re lending money to somebody to start a business initiative. your risk / reward is that you get the opportunity to get an early release at a discounted price, and the risk of losing it if they cant follow through. Whilst I understand that nothing is guaranteed, this was clearly pitched as a “pre-order”, not a speculative investment. As recently as this month, there have been posts advising that not all manufactured units passed QA testing. That implies to me that there are finished products somewhere that have passed QA testing. In addition, the discount was minimal, especially considering that I have been out of pocket for over 6 months now. That more than negates any supposed discount. In my own situation, I pre-ordered so I didn’t miss out when the product was shipping due to potential supply shortages. The Kickstarter campaign at link to kickstarter.com says that the product exists, that it works, that the software is fully tested and so on. The funds are needed to get the final production done. There may be delays etc., but overall, I think a reasonable person would have read this and felt confident that it was a matter of “when”, not “if” these power meters are available to the public. The same reasonable person reading the updates over the last six months would also still be thinking “when” and not “if”; until yesterday’s sudden announcement. well summarise That’s exactly where i am. i thought you’d get a refund if you preordered rather than via KS or IGG?? as that is classed more as a sale of goods than a risky investment? and quite frankly I don’t think Kickstarter is blameless. I don’t see what they add at all and that’s why i’m hoping i can resist ever going to that website (well that didn’t last long had to check the brim bros updates!). they simply get money for providing a website for people to pitch potential investments and take absolutely no responsibility for anything going wrong.